An exciting month of May for Juniors, plenty of playing opportunities! 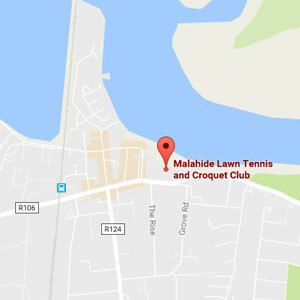 Java Republic Malahide Open Tournament continues over the May bank holiday weekend beginning on Friday 4th and finishing with Finals on Monday 7th May. Finals start at 12noon, come and see some great tennis! Tennis Fun & Games pre Java Open Final on Monday 7th from 9:45am to 11am for all our Junior members, goodie bags and Java republic hot chocolate afterwards. Stay and watch the Open finals beginning at 12noon. The Doubles Round Robin sheets for May are now up on the Junior Noticeboard. All matches are to be played by May 28th, rules are the same for singles yellow & green ball (rules up on noticeboard) remember to have fun, lots of teamwork & enjoy. If Juniors wish to play doubles in the June Round Robin, entry forms are available at reception area or ask at the office. We would like the juniors to avail of some free courts on Friday afternoons and weekends to play their double matches. Reminder that singles matches should all be played by the final date of May 21st. We encourage the juniors to play all their single matches, its a great way to practice the techniques they are learning at coaching. Resumes next Friday 11th may 6pm -7:30pm – contact dircoach@mltcc.com for details & cost. Our new Summer Tennis Program will be issued in the coming weeks, there is something for everyone; Summer camps, Free Supervised Tennis, Tournament Player Preparation, Junior Club Championship Camp, Friday mini Tournaments, Saturday Family Fun Blitz. Please note the Junior Club Championship will take place August 13th to August 19th – mark down now so you don’t have any disappointed juniors. Pizza & Ice Cream Tournament open to all ages and ball colour, red, Orange, Green and yellow – look out for the Teamer app invite/ Teamer SMS from 51001 to accept or decline.